Blog of New Orleans based photographer Scott Myers, featuring news, product reviews, wedding and portrait sessions, photo projects, photography industry news and more. Hands-on experience with Fujifilm X-Pro and Nikon professional equipment, Adobe Lightroom editing, and photography techniques such as double exposures and infrared photography. Over the past few years, covering the annual Tales of the Cocktail event in New Orleans has grown to be one of my favorite things to shoot. In the past I've worked both for various brands as well as Tasting Panel Magazine. This year, I ended up shooting for a cognac conglomerate, Hendricks Gin, and El Tesoro tequila, through a couple of production companies - Teuwen Communications, White Label events, and Fine Young Man productions. 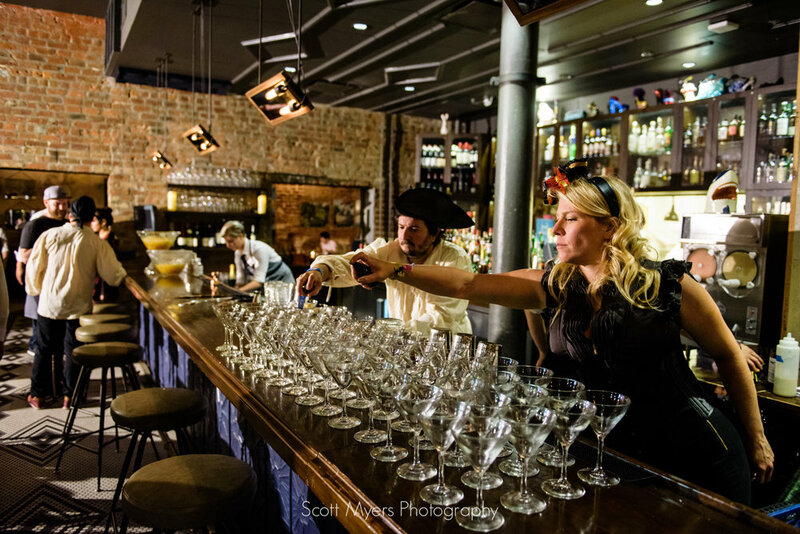 The events can be a whirlwind, as the production companies put together a full experience for the attendees, and I love getting a chance to learn a little more about cocktails, liquor and the history and industry of bartending. I'm always a little sad when its over! Kellie Thorn, Erick Castro and Chris Patino, dressed as pirates. After capturing some bottle shots, I grabbed a shot of each cocktail with the bottle that represented the cognac it utilized, and then moved on to capturing some candid shots of the event. Saturday's event was a tasting event hosted by the Ace Hotel, featuring a variety of tequilas from El Tesoro. They had a great concept that really helped get people involved - a do-it-yourself spice bar with all kinds of salts and spices that could be combined for a rim on a tequila drink. There were a couple of choices of cocktail to go along with your personalized spice rim, as well as cards to write down your recipe and suggestions. I thought it was a cool idea - people love getting their hands on stuff and getting some activity opportunities, rather than just listening to other people talk about it. Before the attendees arrived, I did some bottle shots, and got a few of the master distiller, his daughter, and the brand ambassador. After getting a chance to create their own spice mix, they then went into the next room, which had been set up with a 360 video screen setup that played a custom made video from El Tesoro, showing the factory and scenery from the beautiful area where the agave is grown. It was a very informative presentation from the master distiller on what makes tequila great, and included some tastings of their various offerings. The third event was an extremely educational seminar/tasting held at the Hotel Monteleone, and presented by Kellie Thorn, a BNIC Certified Cognac Educator. She include information about the process of distilling cognac, what makes it special, and what takes so long (aging) to create a great cognac. 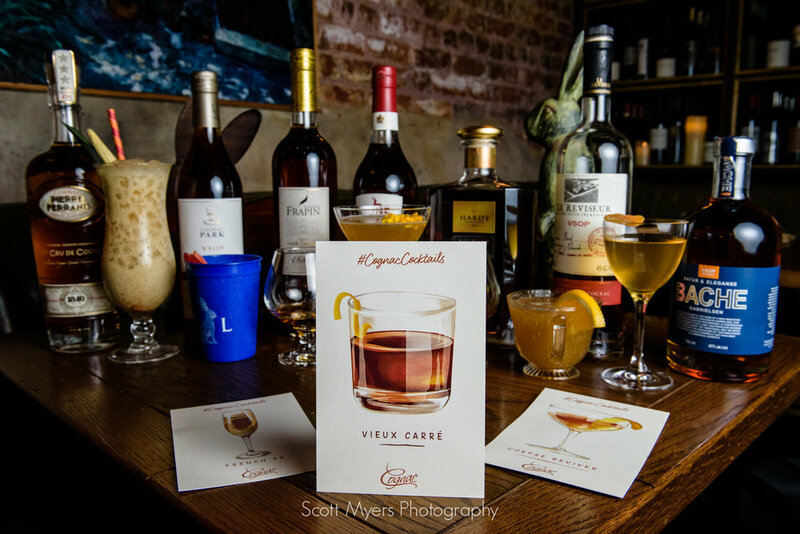 Erick Castro and Chris Patino were also on hand to guide the attendees through the tasting process, as they sampled a wide variety of cognacs. Crowd participation was eager and thorough! Last, but certainly not least, the Hendricks Air Departure Lounge featured a ton of nice stuff for weary attendees right before the flew out. This is a fantastic idea - a place to leave your luggage after you check out of the hotel, massage stations, refreshments, food, cocktails, entertainment. What a way to get your brand some positive karma!!! They had a variety of costumed performers really playing up the steampunk vibe of a airline lounge from decades past, along with a fantastic band, and obviously some great cocktails. TOTC 2017 was a fantastic time, and I can't wait to be back in 2018, learning and photographing at the same time.